In Italy for thirty years under the Borgias they had warfare, terror, murder, bloodshed—but they produced Michelangelo, Leonardo da Vinci, and the Renaissance. In Switzerland they had brotherly love, 500 years of democracy and peace, and what did that produce? The cuckoo clock. With all due respect to Welles (he wrote that part of the script, himself), the idea that the Swiss are a peaceful race of bankers, yodelers, and clock makers is wrong. In modern-day Switzerland, every male who is upright and breathing is in the army until the age of 50. They all keep their military-issue weapons at home, and, I suspect, rank high in the world on the firearm-per-square-person index. True, when one thinks of Swiss soldiers and Italy, the colourful Swiss guards in the Vatican in their 16th–century uniforms pop to mind. Yet, behind today's quaint picture of comic-opera irrelevance is a very long and violent history of Switzerland as the single greatest provider of mercenary soldiers in Europe. Between the Battle of Nancy in 1477 and 1874, when the Swiss constitution forbade the practice, regiment after regiment of Swiss soldiers fought on battlefields elsewhere in Europe. These were not individual "hired guns," but entire regular Swiss regiments contracted out by their respective cantonal governments to serve abroad in return for large sums of money, a substantial part of the income in a canton in any given year. In 400 years of mercenary service, Switzerland hired out some two million soldiers and 70,000 officers. The contracts were typically between a canton and a particular monarch, whom the Swiss were then expected to serve faithfully, no matter what. For that reason, you always have Swiss Guards on the side of established order and never on the side of revolution. One famous episode was during the defence (Aug. 10, 1792) of the Tuileries palace in Paris during the French Revolution. Louis XVI ordered the Swiss Guard not to fire on the crowd, which, at the goading of George Danton, stormed the palace and massacred 600 of them, anyway. The Swiss were very active in Naples from the beginning of the Bourbon rule in the 1730s right up until the final defence of the Kingdom of Two Sicilies at the siege of Gaeta in 1860. 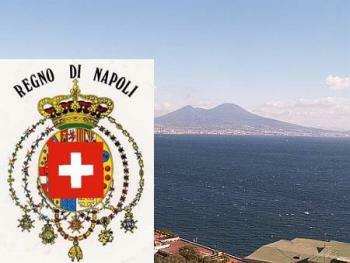 Their first contract with Naples was in 1731 with Charles III of Bourbon and by the mid-1800s there were four regiments (about 7,500 men) of Swiss on constant service in the Kingdom of Naples. The Swiss were important in the Kingdom of Naples in the turbulent year of 1848, when calls for reform and revolution swept virtually all of Europe. In January of that year, there was an uprising in Sicily, and a call for the restitution of their constitution of 1812. (In that year, the mainland portion of the Kingdom of Naples was in French hands, under Murat, while the Bourbon monarchy with their royalist troops and Swiss Guard were holed up on Sicily, protected by the British fleet. The Bourbons granted, with British encouragement, a constitution to their subjects on Sicily. That constitution extended to the rest of the Kingdom when it was retaken in 1814, but it was revoked by Ferdinand I after the riots of 1821.) In 1848, Sicily also declared its independence from the Kingdom of Naples. Ferdinand II of Naples, by any account an absolutist and becoming more and more so the longer this talk of a "united Italy" continued, obviously wouldn't buy the part about independence, but he did feel compelled to grant another constitution of sorts. That put the situation in limbo for a few months. Then, in April, Ferdinand declared war on Austria, a move—had things gone differently in the "what-if" school of history—that would have put him on the same side as the Savoys of Piedmont—a united Italian army. That was not to be. Banal events in Naples the next month involving the form of a parliamentary oath of office led to Ferdinand closing the parliament, revoking the constitution, and recalling his troops from the north. In May an uprising took place in the city of Naples, and Ferdinand relied heavily on his Swiss Guards to suppress it. The four Swiss regiments in the city lost a total of 205 troops in the single day of combat in the city and came under severe criticism for their brutality, investigations of which were conducted even by the respective cantonal governments back in Switzerland. Sicily, by that time, was in full revolt, and later in the year, the Swiss sent their Neapolitan regiments as an expeditionary force to help quell the revolt on the island. That took until early 1849. The Sicilian episode included the infamous bombardment of Messina, an act that earned Ferdinand II of Naples the nickname of "la bomba" for the rest of his life. Throughout the 1850s, the Swiss Guards helped to prop up the Bourbon monarchy. They stood by their contract even at the end—the hopeless defence of Gaeta in late 1860 and early 1861 in the face of the overwhelming forces of Victor Emmanuel II. Those that survived accompanied the defeated Bourbon king, Francis II, into exile. After the unification of Italy, the Swiss maintained for well over a century a cultural presence in Naples in the form of the so-called "Swiss school," a combined elementary and middle school. It was one of a chain of such schools in the world run by the Swiss government for the children of Swiss diplomats and businessmen abroad in the world. With the passage of time, the Swiss school in Naples no longer really served that purpose and became, essentially, just another Italian school with, at best, tenuous connections to Switzerland. I taught there for a while and was at the meeting when the bean counters from Bern (and a couple of gnomes from the banks in Zurich) came down and closed our Swiss School some years ago, saying that Switzerland couldn't afford to keep it open. No kidding, they really said that.